When most persons hear the word 'dinosaur', images of Jurassic Park and Godzilla immediately flash to mind. The term is derived from the Greek words deinos ('fearfully great' or 'potent') and sauros ('lizard'), although dinosaurs technically aren't lizards. Their existence has been one of the many motions in the decades old debate about Evolution versus Creation. There is still quite some mystery in the scientific community about what exactly led to the extinction of the species. Dinosaur tattoos have very little spiritual meaning. Persons with these designs tend associate with the awe inspiring strength and power of a snarling T-Rex on the hunt rather than identify with the feeling of being outdated. 'Being a dinosaur' is a common way to express the antiquity of an object. "Music CDs are quickly becoming dinosaurs." Tyrannosaurus rex is the King of the Dinosaurs. They are the most popular animals of the species and are the main feature of many dinosaur tattoos. Who can forget the image of a roaring T-Rex in Jurassic Park! T-Rex tattoos are generally associated with untameable power and strength of these massive beasts. The Disney classic, The Land Before Time (1988), introduced the world to the lovable characters Cera, Spike, Petrie, and Ducky. 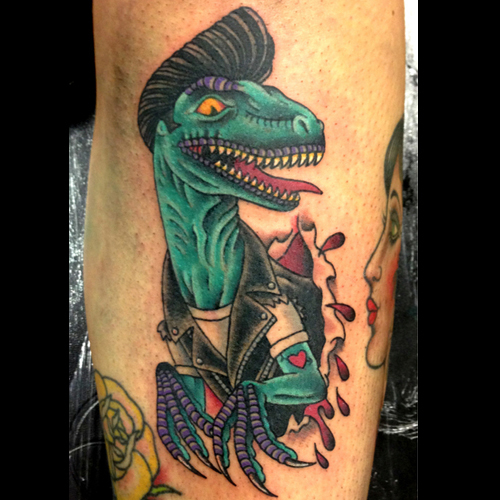 Cartoon Dinosaur Tattoos are a shout out to childhood memories and the days of Innocence. Choosing the right tattoo design is tricky. When doing so, think about what your new tattoo will symbolize and where it will be placed on your body. If you need some inspiration, then visit our design page or take advantage of our Custom Service, where our team can design a truly unique piece for you.